Pellet stoves require proper venting to prevent the release of dangerous fumes like carbon monoxide into the home. Vent pipes are commonly run through the ceiling of a room and out of the roof, but this is difficult for a pellet stove in the basement. Choosing a creative option for venting your basement pellet stove will increase its safety and heating efficiency. Most of the heat that radiates from a pellet stove is released by the metal walls of the unit, but some heat travels up the vent pipe. Running vent pipes through rooms of your home and out through the roof may help heat the house without requiring a second pellet stove on another floor. A triple-walled stove pipe will provide the most protection for the walls the pipes run through from heat damage. However, this pellet stove venting method may not be possible in homes with young children that could burn themselves on the exposed pipes. This type of pellet stove installation will take more work than other methods, but it will prevent the waste of exhaust heat. The simplest way to vent a pellet stove is through a piece of horizontal pipe that exits the home through an exterior wall. Stove pipes often require special wall protectors to prevent damaging the drywall or wooden framing of the wall, but the cinder blocks used to support the weight of the home in many basements is not combustible. Knocking out a piece of concrete or cinder block to install a horizontal vent pipe may not be feasible in a pre-existing home, but the basement construction of new homes could be planned around this feature. Horizontal vent pipes must end at least 6 inches away from the exterior wall and must be located high enough that snowfall will not block it. Removing a furnace or dryer from your basement to accommodate a new pellet stove may provide you with adequate space for installing vent pipes. 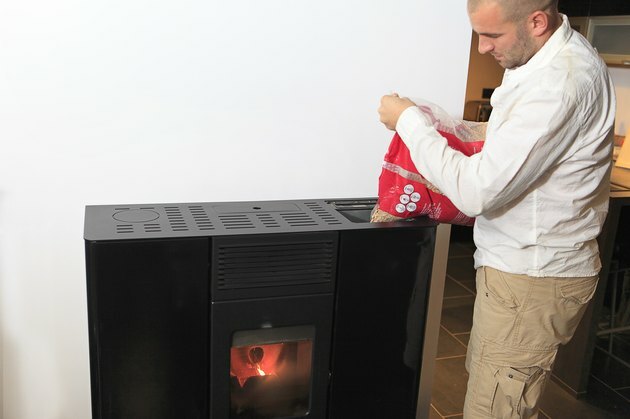 Dryer venting cannot be used with a pellet stove, according to the Encyclopedia of Alternative Energy and Sustainable Living, but once this flammable material is removed, the gap left may easily fit the double-walled pellet stove pipe. Furnace vents are designed to withstand high temperatures and, if in good condition, should be sealed tightly enough to prevent carbon monoxide leaks. It may be possible to connect the pellet stove to this venting and prevent the hassle of installing new pipes.